On January 20, 2017, we inaugurated Donald J. Trump as the 45th President of the United States. President Trump has promised to shake up the federal government, and if his nominee for Administrator of the United States Environmental Protection Agency (EPA), Scott Pruitt, is confirmed by the Senate, a shakeup at EPA is likely. Mr. Pruitt has been the Attorney General of Oklahoma since 2011 and in that time has reportedly sued EPA 14 times on behalf of the state. We will also see changes at the regional levels of EPA with new Regional Administrators appointed to each of EPA’s 10 regions, including new Regional Administrators in Region 2, which includes New Jersey and New York, and Region 3, which includes Pennsylvania. Although we do not know who the front-runners might be to fill these critically important positions in Region 2 and Region 3, historically the Region 2 Administrator has alternated between a New York and a New Jersey appointee, so next up would be a New Jersey appointee. But like so many other things with the new Administration, it’s difficult to say whether the old practices and customs will be followed. While things are being shaken up in the Executive Branch, Congress is also already moving in ways that may dramatically affect the environmental landscape. Earlier this month, House Judiciary Committee Chairman Bob Goodlatte reintroduced legislation in the House to change the processes by which Federal agencies, including EPA, formulate new regulations and guidance. The bill, titled the Regulatory Accountability Act of 2017 (H.R.5), is also intended to fundamentally change the judicial review of agency regulations and guidance so as to eliminate the “deference” afforded agencies by the courts. The bill, which has already passed the House, is intended to repeal “Chevron Deference,” the U.S. Supreme Court doctrine articulated in a series of decisions including Chevron U.S.A., Inc. v. Natural Resources Defense Council, Inc., 467 U.S. 837 (1984), whereby federal agencies are afforded deference by the courts when interpreting legislation they are required to implement and promulgating regulations pursuant to that legislation. Whether or not the Regulatory Accountability Act ultimately passes in its current form, the legislation is emblematic of the constraints and restraints we expect to see imposed upon EPA from both the Executive Branch and Congress. These changes may push more environmental regulation and enforcement to the state level and we may expect an uptick in activity, including litigation, by non-governmental organizations as interested parties try to fill the void that may be created by a pullback in federal environmental regulation and enforcement. 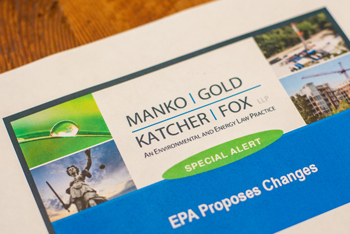 Against this backdrop of potentially broad changes on the horizon in the environmental and energy arena, the attorneys and technical consultants of Manko, Gold, Katcher & Fox have prepared the following forecast of regulatory, legislative, and litigation developments in specific environmental and energy areas that will bear watching in 2017.